The Aero Precision Enhanced KeyMod (EK) Handguards provides a lightweight free float design for your custom M5 .308 build. The KeyMod system allows advanced modularity past the current 1913 picatinny rail system. 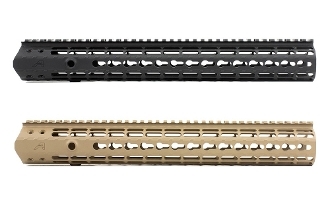 Machined to mil-spec dimensions and engineered to perfection, this handguard eliminates bulk while retaining strength and stability. ***Barrel nuts come in two varieties, either ARMALITE threaded or AERO/DPMS threaded. If selecting a barrel nut, please select the correct one that matches your upper receiver style. Make sure to select a barrel nut option from the drop down menu above (shims included). The Aero Precision handguards use either the DPMS/Aero or Armalite interface and do not work with a standard barrel nut. If you are using the Aero Precision M5E1 Enhanced Upper Receiver, no additional pieces are needed. Purchased with a handguard, the M5 Barrel Nut is only $25 ($40 when sold separately).